Sizes: How big of a backpack do you need? Depending on the size of your dog, you will need a bigger or smaller pack to make sure your pup has enough room. Padded Straps: Does the bag have padded straps? Padded straps can help to make the journey a little more comfortable for you and your shoulders. Colors: We’ll let you know how many available colors the bag comes in for this stat. We’ll go into a little more detail about the colors in the descriptions. Breathable Material: Is the material breathable? You’ll want a breathable material if you take your pup out in the heat. We’ll let you know in the description what the material is. Washable: Is the dog backpack carrier for hiking machine- or hand-washable or not? We’ll let you know how to keep it clean in the descriptions. Airline Approved: Is this approved for airline use? If you want to bring this on a plane with you for your pooch, you should take a look at this important stat. Now that we have covered the stats for the best dog carrier backpacks, let’s take a look at our top ten! We have researched and reviewed all of these, compiling some of the top-rated, best dog backpack carriers that we could find. Each of these was chosen because they were high-quality and dog-friendly carriers. We love all of these bags, but there were two that really stood out from the pack. These were the first and second backpacks on this list. The first is our Top Pick which was our favorite of all ten of the backpacks. The second is our top Budget Pick; it’s the best dog backpack we could find that is both inexpensive and amazing. If you’re in a hurry, make sure to check out these out first. Now onto those reviews! Here’s our Top Pick of all the best dog carrier hiking backpacks that we reviewed! This beautiful backpack comes in a variety of colors and sizes. You can get the Mangostyle Dog Carrier in black, red, blue, green, and purple. They also come in a medium, large, and extra large, perfect for cats and small- to medium-sized dogs. 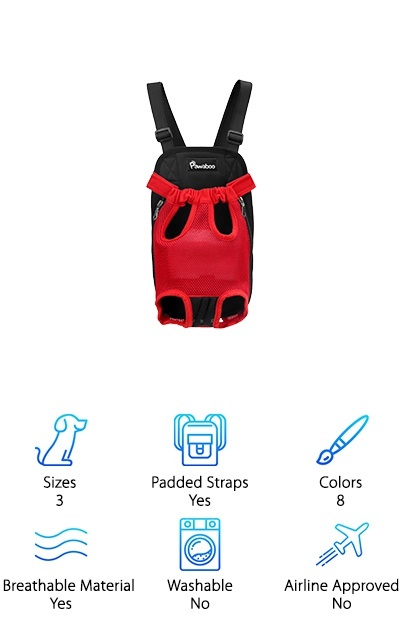 The mesh design makes it great for even hot weather; the breathable fabric makes a great little window for your pooch to look out and get some air through. The panels are all foam padded to makes sure that your pet is cradled in comfort. The internal straps keep your pet secure while giving them a great view of the outdoors. And the best part is that the Mangostyle Dog Carrier is airline compliant too, making it the perfect travel bag for your dog. Looking for the best dog backpack for hiking that won’t break the bank? Our Budget Pick is the Geepet Dog Hiking Backpack. It comes in several sizes for pets up to 22 pounds. It also comes in four different colors, including black, rainbow stripes, denim, and white-and-blue stripes. The material is very breathable to keep your pup from getting overheated. The design makes it easy to wear either on your front or on your back. 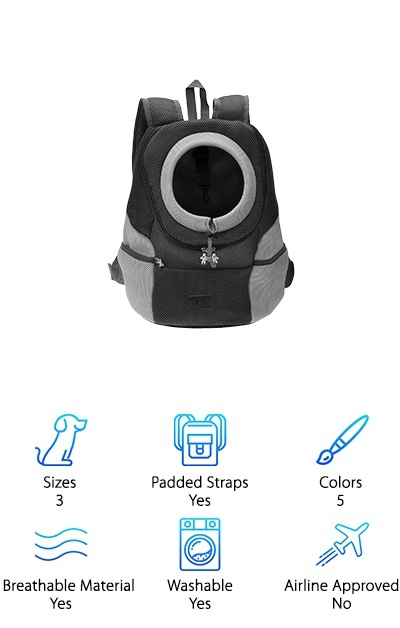 The dog’s legs have holes in the back of the backpack for a comfortable fit for your dog. They also have their head free so they can look, sniff, and interact with you as you walk. And this great backpack is also comfortable for you to wear with its padded straps and cool design! The Pawaboo Pet Carrier Backpack is another legs-out designed backpack that comes in a ton of styles and colors. This backpack comes in small, medium, and large, suiting dogs up to about 15 pounds. It comes in a ton of colors, including black, red, light blue, rainbow stripes, camo, orange, and pink. It’s made from super breathable mesh to keep your pet cool while you walk. It’s comfortable, stylish, and really durable too. But our favorite part is how easy it is to use. The Pawaboo Pet Carrier Backpack is designed with simple release buckles so you can open them with just one hand. The legs-out and tail-out, breathable design means maximum comfort for man’s best friend. That means you can bring your pooch with you everywhere if you want to! Want a sweet backpack carrier for dogs that allows them to move around a little? The Petsfit Comfort Dogs Carrier is more like a little cage for your fuzzy friend to lay down, sniff, walk around, and still be able to travel with you. 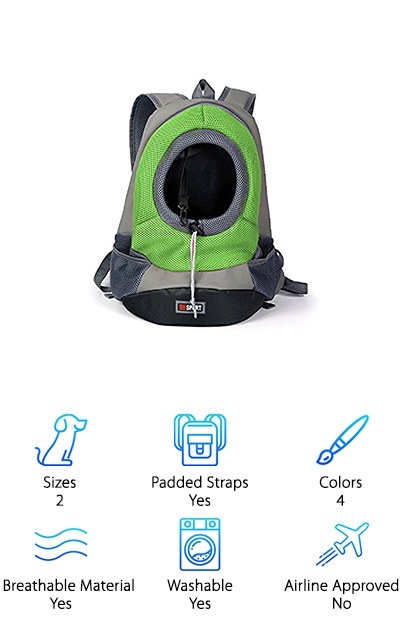 This backpack is great for small dogs and cats alike up to 15 pounds. It comes in four colors, including black-and-orange, gray-and-green, gray-and-pink, and gray-and-blue. This case is sturdy and durable, lined with a comfortable, removable and washable liner for your pet to relax. The boxy backpack has four little mesh windows for your pooch to sniff and look out of, giving them some outdoor time without exposing them to the outside. And it’s even comfortable for you too! The padded straps make it as comfortable as possible for you. The Nicrew Front Dog Carrier is another great dog carrying backpack that will change how you bring your pet along with you! This easy on and off design is comfortable for both you and your pet. The design allows your dog’s legs and head out for ultimate comfort. The mesh panels breathe for your pup to keep them from getting overheated. They come in small, medium, large, and extra large, giving you a variety of sizes to choose from to get the perfect fit for your pooch. It also comes in several colors, like denim, black, and rainbow stripes. You can wear this as a backpack or in the front to ensure maximum comfort for you and your pet. It’s easy to get your pet in and out. It’s padded for both you and your pooch, so you’ll both love to go for walks together. The Pashion Breathable Pet Carrier is a carrier that is easy to use, durable, and can be used in a variety of ways. 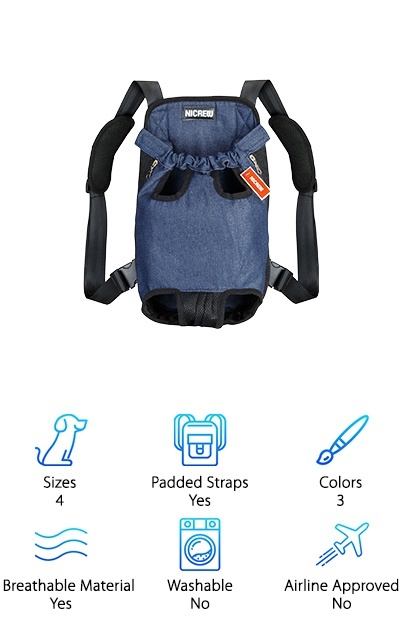 This backpack comes in two sizes, small and medium, that suits most small dogs under 9 pounds. 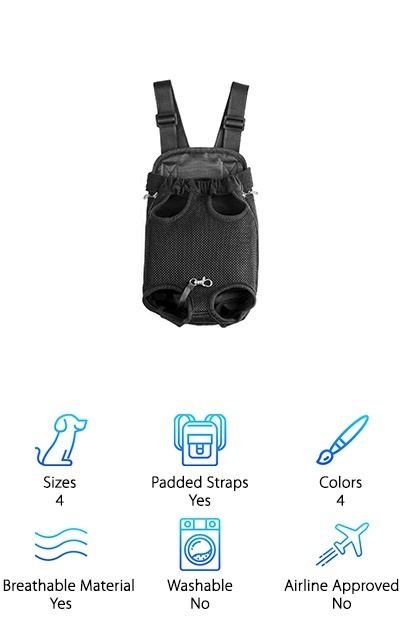 The backpack allows free movement of the head while strapping the dog’s body securely into the pack to keep them from running away. The adjustable buckles and padded straps make them comfortable to wear for you. And the inside of the pack is breathable and padded for your pup’s comfortable. It also has pockets for storing leashes, snacks, bags, and other necessities. The removable bedding at the bottom is easy to wash and easy to put back. This is perfect for everyday walks! And it comes in four beautiful colors, including green, blue, rose, and yellow. The Natuvalle Pet Carrier Backpack is a sturdy, beautiful pet carrier that really gives your pet freedom and safety. 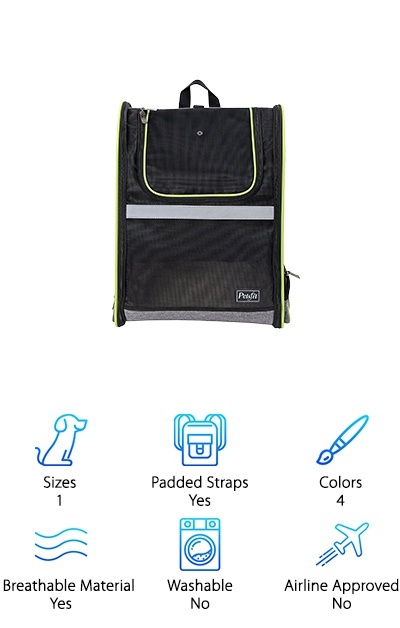 It can be used as a carrier or a backpack, the mesh windows giving your pet air and access to the outside safely. This bag is airline approved in the extra small, small, and medium sizes. It only comes in blue, but the blue is rich and beautiful. This pack comes with great pockets to store your pup’s stuff. The fabric and zippers are all reinforced to keep your pet securely locked inside. This bag is very comfortable for both you and your dog, and it is perfect for travel of all kinds. And the bottom is made from non-toxic, durable wood to keep your pet secure and safe. So if you love to travel and want to bring your pet along, we think this is the perfect bag! Need a bag that can hold a dog that’s a little bigger? The CozyCabin Dog Backpack can hold pups up to 23 pounds, making it one of the largest bags for travel for your dogs around. The backpack is designed to let your dog’s head out of the bag, allowing him to be petted, to breathe, and to sniff comfortably outside. It attaches to your dog’s collar to keep them secured in the bag. 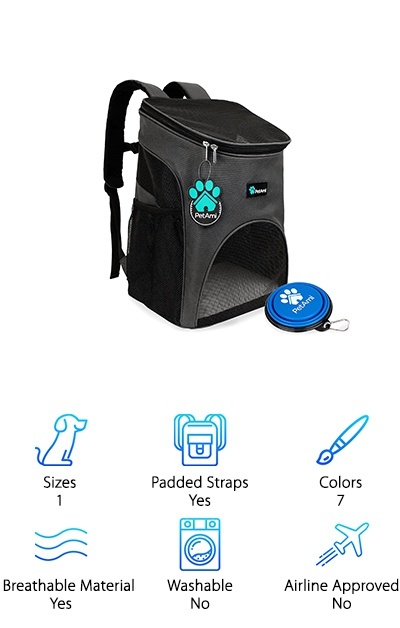 It’s a great bag for small dogs and even cats! The CozyCabin Dog Backpack is breathable and soft. It’s comfortable for both you and your pets too. It comes in blue, black, green, purple, and red. So you can match your bag to your style! And nearly everything in this bag is adjustable to your pet’s size to make it one of the coolest bags around. Want a bag that comes in a ton of colors? The PetAmi Premium Pet Carrier is a breathable, durable pet carrier that comes in seven colors! It comes in black, gray, blue, pink, purple, red, and light blue. This is designed to comfortably fit most small pets, whether they are cats or dogs, or something else. 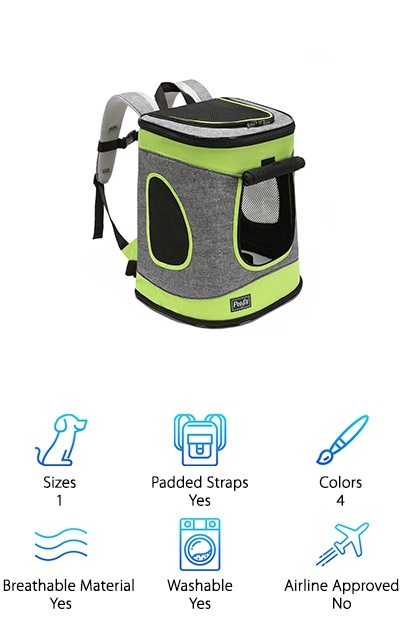 Any small pet you want to bring around with you will most likely be super comfortable in this little carrier. It’s like a little portable cage for your best friend! It’s well-ventilated with big mesh windows for your pet to see out of and be able to breathe through. And the best part? It comes with a free, collapsible bowl for your pet to drink from! 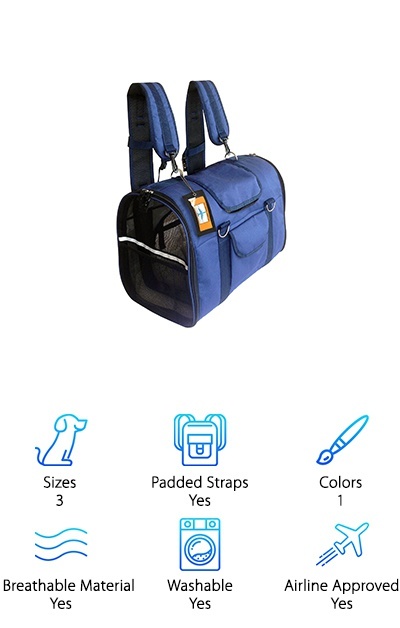 This awesome carrier is designed to be great for travel, walks, hikes, or even just a comfortable trip to the vet. Want a super cute, designer bag for your pooch? It’s a bag that only comes in one size, great for most small pets. The bag is vented with mesh windows but allows your pup to stick his or her head out of the top. It features a safety harness to keep your pet in place and safe. It’s also padded for your fuzzy baby’s comfort. The Petsfit Ventilated Dogs Carrier has adjustable shoulder straps and a padded handle to ensure your comfort too! These are designed for dogs up to about 13 pounds, and can comfortably be worn on your front or back. It comes in gray, black, red and gray, and gray and green. And it’s even environmentally safe and non-toxic for your pets and animals all around the world!